EVmoto Roadtrip Pikes Peak Part 1: Highs, lows and facing fears. The biggest ride of my life so far in miles to ride, time on the road, time away from home, and complexity began with a visit to a friend. It wasn’t just any visit, but specifically the kind that no biker really wants to make. Lisa loves to ride, and I say that in the present tense because she will always be a biker, even if she never regains use of her legs. I know this because I’m the same way. There is something out there for everyone that drives them forward, that makes them look forward to the next day. Even when I’m not looking forward to going to work, I can relax a little knowing that my motorcycle will take me there. No day can be too bad if I can ride afterward, but what if I couldn’t? I had seen the pictures, but pictures aren’t the truth. They are subject to lighting and framing, contrast and color balance. It looks bad, but it can’t be that bad right? No, the pictures were better. They didn’t carry the emotion of standing in the room with your friend with most of her body in braces and tubes running into a contraption over her mouth. I watched as her chest moved up in down in perfect time and observed the never changing readout from the machines. She’s stable, she’ll make it, but right now I wonder, is she feeling anything at all? Should I talk to her, should I try to wake her up? I didn’t do either. I didn’t know what to do. I just stood there for a moment a long moment, perhaps too long a moment. Finally I said “what would Lisa do?” She would ride. And so I did. Get better friend. Maybe someday we can ride together again. Last night I did something I’ve always been terrified to do. I hooked my bike to the charger connected my accessory charger, covered myself in so much bug repellant it stung, and laid down on a bench. I’ve never slept in public. I don’t trust people. I don’t want to be vulnerable near them, heck I don’t want to be vulnerable period, but we all need to sleep, and Florence doesn’t have any rooms. Seriously, there were no rooms under 100 dollars in the whole city. This put a kink in my plans for the evening as the nearest charging station was 30 miles away and in a grocery store parking lot with no lodging in the area. After the longest ride ever on my Zero, 88 miles, I pulled into the Fry’s parking lot with 3% left in my battery packs. I accidently proved to myself that the bike was capable of handling the longest stretch of this trip, so that’s one fear down. It took about 3 hours to get the state of charge high enough to make it to the next station. It turned out that due to the Florence incident I was ahead, both in time and distance so when I arrived at the next station there was still 40% or so on the battery. The blink charge station was located at a McDonald’s/ Shell gas station in North Phoenix, but there was this guy there, circling the block, driving fast through parking lots and just generally looking sketchy. He later picked up two guys, was gone for 15 minutes came back and dropped them off in the middle of the street, yes he dropped off people from the left turn lane. By this point I had become concerned that maybe I wasn’t in the safest of places so I headed for the Blink chargers at Honeywell. That location was perfect there was literally no traffic and it was far off the street. For the first time in my life I laid down on a bench and woke up 1 ½ hours later to the sunrise and chirping birds. I was also ahead of schedule, having not spent 8hrs in Florence. Not a bad start. I’m finally out of Phoenix! Cooler temperatures await. I couldn’t have been more wrong. The ride up to Cordes Lake was a blast. It was only about 40 miles or easily within range. What this translated to sportbiker: “There is absolutely no need to ride conservatively. So I did not. Even with an extra 70 pounds of charger, cables, adapters, electronics and their accessories the Zeros torque made quick work of those steep uphill roads. For those of you that have not made the climb from Phoenix to Flagstaff or Prescott, I-17 is notorious for breaking cars. There are even signs warning to shut off the A/C as to not overheat the car. The Zero had no problem. I click it into sport mode and zipped around cars, accelerated where others were losing speed and still made it to Cordes Lake with around 40% remaining. Today is a good day. I plugged my bike and chargers into a Nema 15-40 to 4x Nema 5-20 adapter and charged off the RV parks 240 and 50A power. For those of you used to Blink public chargers, this is actually more powerful. If you ever need a charge between Flagstaff and Phoenix keep them in mind Quail Ridge RV Park, it was $5 dollars. I came out of the clubhouse fresh and ready to go only to find my bike losing it. Every warning light, ever possible readout and all the numbers were flashing on the dashboard. I thought I broke it, seriously for days I thought this. In a panic I looked up the nearest Zero dealer which was only 10 miles away and rode it there. There was a Veterans event taking place and they were busy, really busy, but the service manager still took the time to listen to my problem. He asked me to demonstrate, so I plugged the onboard in, and the bike charged, just fine. I hung out at Grand Canyon Motorsports for the next few hours waiting for the bike to act up again. I talked to the Zero marketing director who happened to be there, talked to some tough looking Harley guys that were open enough to come over to the Zero display, had something to drink (soda,) checked out this cool 2 wheel drive sidecar called a Ural, and had a bit to eat. I came back to the bike to find that it charged fine. It was now at 87% and could easily make the next stop in Sedona so I headed that way. Btw Jerome is AMAZING!!!! It too some architectural and engineering creativity to build this mining community in a place with absolutely no flat land. To say it’s built literally on the side of a mountain is not an exaggeration. Assuming the previous malfunction was a fluke, I connected the bike the same way I had in Phoenix, I went for a walk, watched a few videos on UX design and came back to the bike freaking out again. I was devastated and made a depressed giving up style post in the Zero motorcycle group on Facebook. Terry Hershner (Electric Terry) responded and we ended up talking on the phone for a long while about how to still finish the trip. Good thing, it got better but not right away. The night ended with a fun blast up to Flagstaff, a full KOA, frustrating trying to find a charger open to the public (if anyone knows how to use the ones at NAU, please comment,) before finally giving up and getting the 3rd cheapest hotel I could find (the reviews didn’t say stay away like the previous two) that actually turned out to be one of the nicest places I’ve ever stayed and had wall outlets all over the parking lot. I had a good, too good (I overslept) night of sleep and started out for my biggest day yet. End of Part One. Stay tuned. Computer issues prevented uploading of pictures and link. Expect a new and improved version soon. As promised here is my step by step on how to build a fast charger for your Zero motorcycle. My configuration will let you charge at 34-38 amps up to 80% SOC from a j1772 EV plug or from a 14-50 NEMA RV plug. You can also do as I often do at home and charge with three 15A house circuits. There are lots of options, some that will only work with high current outputs like the NEMA and J1772 and there are others where the accessory charger can run off a single 110v wall outlet similar to the Quiq charger that Zero sells. My How-to is specifically how to build the charger that I built, but I’d be happy to offer guidance on a variation, just email me at: badmotoscootin@gmail.com, message me on Facebook, or comment below. Nothing I discuss will connect without also running the onboard charger. The circuitry to do that is complicated and I didn’t use it myself so I choose not to advise in areas where my knowledge is limited. You can find this information on the electric motorcycle forum, but it might take a while. 4 ft 12ga power and ground wire. I used speaker wire so that the wires would remain together without being rapped or heat shrunk. 12ga Speaker Wire If you use more powerful supplies you will need a lower gauge number. Anderson components. Unfortunately all of these have to be bought separately. I found no place that sells everything as a kit. I bought all parts for the connector from Mouser.com they are linked below. x2 Connector pins Heavy Duty Power Connectors SBS50 #10-12 AWG LOW DETENT CONTACTOR I know, the connector name is different, but they use the same pins. Two 14ga 5-15 cords (these are normal plugs that plug into your 110V outlet.) I bought these locally. Assortment of 10-14 gauge crimp connectors. Rings or open are fine. I prefer rings. A way to conncect the supplies to each other. I used Dual Locks and stacked them offset enough to access the screws. 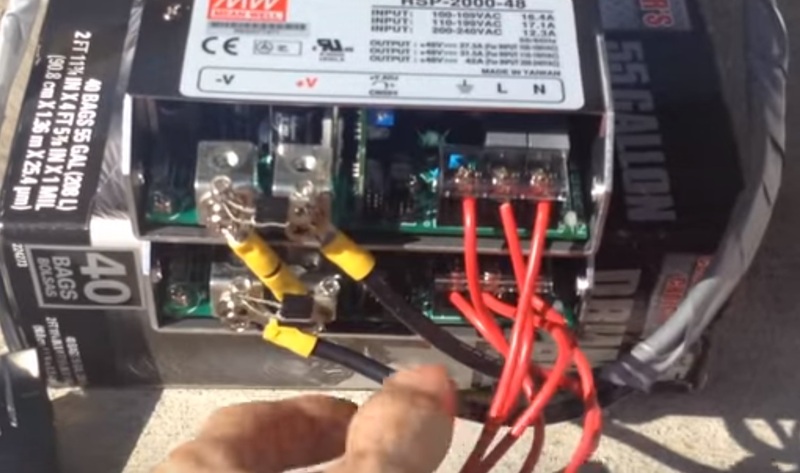 The meanwells are AC to DC power supplies. They are overcurrent, over voltage and overtemp protected. Each is made to supply 48 volts of dc power at a rate of 21 amps or 1008 Watts. The voltage can be adjusted via a built in adjuster up to 56V allowing the supplies when run in series to a single connector to supply 112 volts. On the 2016 Zero motorcycles this is a state of charge of 80%. Zero’s onboard charger charges at a rate of 13 amp. When the fast charger and the onboard are running together (the only way this setup will work) the total charging current is 34A. When connected to a 240V J1772 EV charge station the combo is capable of pushing 38A. Not bad right? It would take two of Zero’s Quiq chargers to accomplish that. The first step is to set up the power supplies. Make sure they’re voltage is set independently. The Meanwells come without any wires so they will need to have a pigtail installed. I recommend using a normal 110 house plug because it allows for greater versatility. The Meanwell’s AC in are labeled with L, N and a Ground symbol. L = line (this wire is black) N = neutral (this wire is white) Ground is the green wire. Next, plug in the power supply. Now that the power supply how has AC it’s time to set the voltage. Make sure not to touch the DC out. 48 volts is 4 times as much as a car battery. Touching it will not feel good and in rare cases it could kill. Don’t let this scare you away. Just be careful. Use the precision Philips screwdriver to turn the adjustment screw clockwise to the stop. It is possible to go too far, causing the voltage to go below the max of 56. That’s why they need to be adjusted now, before being hooked together. Use the voltmeter to make sure the voltage is showing 56V or close to it. They don’t need to match exactly. Repeat the above steps for the second power supply. goes to the Anderson connector’s negative pin. Its positive goes to the second supply’s negative. Then the second supply’s positive goes to the Anderson connector’s positive pin. Diodes and Series wiring. Screenshot from Burton's video. 4. Building the Anderson Connector. Make sure both power supplies are off. Crimp stripped back wires into the Anderson pins. This will take work unless you have a leveraging crimper. The pins are very thick. Ensure that you have the polarity correct before inserting the pins in the connector. Make sure that the notch is facing the direction of the spring. The spring inside the connector will latch into this. You should hear it. Lightly tug the wires to make sure they properly latched. If you bought the handle/ wire clamp (which you should have) attach the bottom part of the clamp to the connector with the supplied screws. Line up the wires so that they are in the pinch point formed between the top and bottom of the clamp, Then screw down the top part of the clamp. Don’t overdo it, you don’t want to cut the wires, but doing it this way makes it harder to pull the wires out of the connector as they are clamped into place and the handle gives you something to pull on other than the wires when disconnecting the plug from the bike. You should now have a working quick charger. To make sure that everything is good, plug both supplies into the wall. DO NOT touch the terminals inside the Anderson connector. At minimum they are carrying 96V at maximum over 112. These numbers can kill you. Also be aware that plugging both supplies into one circuit will trip the circuit breaker unless its rated for 40A 110 or 20A 220. On the road, you are not likely to find 3 separate 110v circuits in close proximity to each other. If you intend on using your fast charger away from home you may want to consider buying a j1772 adapter from tucsonev.com My setup Is not shown on the website, but he can make you a custom one. You also may want to consider a 14-50 Nema RV plug splitter.This will let you charge at up to 38A from the plugs that are found in RV parks. I personally carry both if I take the bike out of town and will be using both on my Pikes Peak trip. * It is not necessary to install the diodes for the charger to work, exempting power loss to only one power supply, the only thing necessary to prevent reverse current is powering both supplies prior to plugging in the Anderson connector. 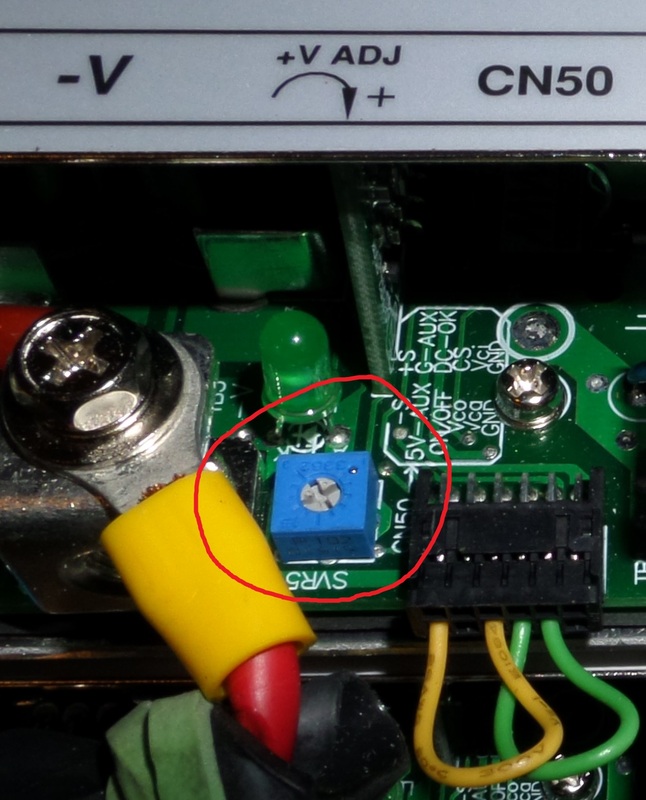 With the connector unplugged, you have an open circuit and there is no current flow. Add me on instagram @badmotoscootin to follow that EVmoto trip to Pikes Peak mentioned above and to see pictures from life. Follow this blog for updates, more how-tos and random musings. I hop you got something out of this. I certainly enjoyed writing it. Trying out some new things. Bear with me peeps. Expect this blog to look different every few weeks for the next few months. I'm teaching myself to code and I'm starting with HTML and CSS. I will likely need both for the launch of my main project. I don't know how long it will take to learn, but I intend to learn a little something every week and apply it to making this blog become stellar awesomeness.... or just way too busy like my old Myspace page. You guys remember that? Oh the days we all knew html. It's funny what atrophies when you don't use it. When I begin my life of computers, business, I need to make sure that I fix a car every now and then or diagnose an electrical problem just to make sure I still know how. So apart from the warning about rapid changes this post had a purpose, something I would like to document, a little experiment. If you read the first post, then you know I'm taking my electric motorcycle on a slow ride to the Pikes Peak International Hill Climb. As I mentioned this will be a SLOOOOWWWWW ride, and it will be that way because at highway speeds my range is between 60 and 70 miles and the bike will take 4hrs to charge, down half from stock (that will be explained in a later post.) Obviously there will be a lot of downtime. I intend on using this time for something unorthodox on vacation, work. There will be dozens of hours of free time on this trip and thanks to my incidental discovery of Lynda.com I will have plenty to do. So what's the new thing? I want to try location independence and this seems the perfect way to test that. I need to be able to concentrate on working on my one big thing when I'm working and concentrate on fun when I'm having fun (riding, photographing and checking out the PPIHC, and maybe making some RL freinds out of some Facebook friends if I'm lucky.) If I do in fact make it through 44 hours of learning material while on the road I will have confirmed my ability to get stuff done without a teacher or a boss keeping me on task. I'll have confirmed that I have what it takes to live a location independent life and I'll start putting together the pieces that will let me have one in a few years. If you are interested you can follow my progress or lack thereof here and on my Instagram. You can also add me on Facebook, but unless you like arguing about politics, race, and religion I don't recommend it. In fact I won't even link it here. The next post will be about how I built the boost charger for my Zero S 9.8 electric motorcycle as well as a step by step by step on how you can build one too. I needed that, being a car mechanic, not an electrical engineer and more or less pieced it together with help from facebook and the electric motorcycle forum. Now that mine works I'll make it easier for the next batch of new EV converts. Expect it in about a week.